This is a new recipe which came with the ‘baby’ Rockcrok. 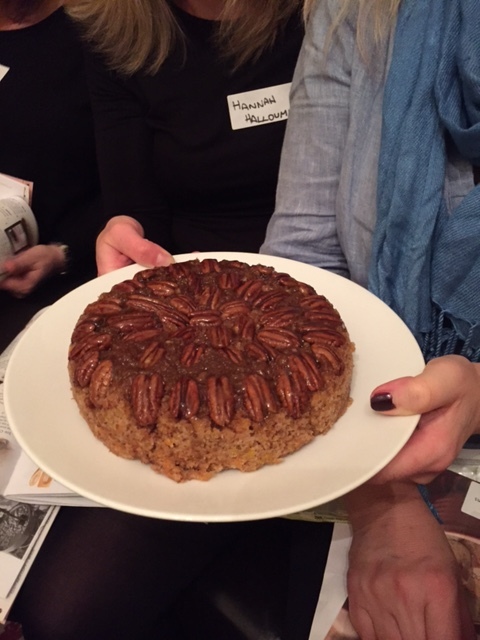 I have eaten it once before but not actually made it – until last night’s Pampered Chef party. Well, I still didn’t actually make it – the guests did! – but I helped out here and there and saw just how easy it was. The thing which impressed me the most was how easily it dropped out of the Rockcrok when I turned it out. It just came straight out, absolutely no encouragement needed!! Plus it tasted absolutely fab, not at all rubbery like some microwave cakes can be. LOVED it! Make it – you won’t regret it. Upside Down Pecan Carrot Cake. Beautiful! Add butter, 50g of the sugar and water to Rockcrok Casserole (1.9l). continuously using Small Mix ‘N Scraper. Remove from heat and cool for 2 minutes. Starting on the outside edge of the Casserole, carefully place about 85g of the pecans upside down, close together in a circular pattern, in brown sugar mixture. Set aside. Coarsely chop remaining pecans in Food Chopper. Set aside. Peel carrots using Vegetable Peeler and trim ends off using Paring Knife. Grate carrots using Adjustable Microplane Coarse Grater into a Classic Batter Bowl. Zest orange using Microplane Zester directly into Batter Bowl. Using Small Adjustable Measuring Spoon add baking powder, cinnamon, mixed spice to the Batter Bowl. Add remaining sugar, flour, and chopped pecans to the bowl and stir using Bamboo Spoon. In Small Batter Bowl, whisk eggs and oil together using Stainless Whisk. Pour egg mixture into the carrot mixture, mix until well combined using Small Mix N Scraper. Spoon mixture carefully into Rockcrok and level surface. Microwave, uncovered, on HIGH for 7-9 minutes or until a wooden cocktail stick/ cake tester comes out clean when inserted into the centre of the sponge. The top will look quite moist and side shrunken away slightly. Remove cake from microwave to Stackable Cooling Rack. Let it stand, covered for 5 minutes, if you can resist the smell. Carefully invert the cake onto a serving plate. Serve warm or cold. 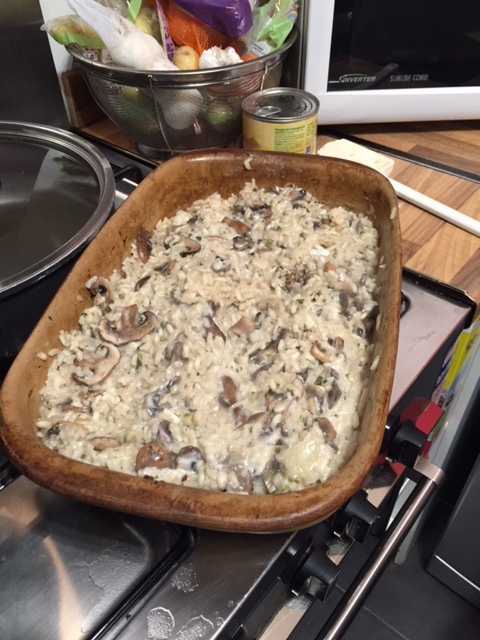 Mushroom Risotto – Oven Baked… no Stirring?!! 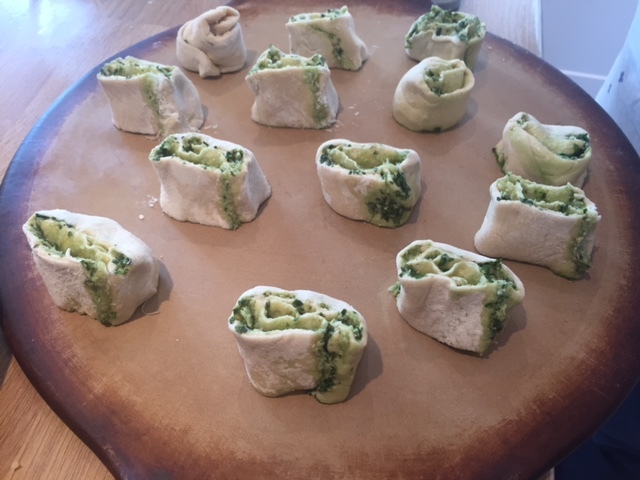 Here is the second of my 2 surprisingly fabulous recipes I’m sharing with you tonight!! Pampered Chef Stoneware is amazing stuff which allows you to do many “chuck and bung” meals, where you literally chuck the ingredients in the Stoneware and Bung it all in the oven to cook. Risotto is one of those recipes which just looks like you are doing magic rather than just cooking! Honestly, this risotto takes about 6 minutes to prepare (tops) and then you bung it in the oven until its done. No stirring, no hassle, no waiting by the hob for half an hour – just Chuck and Bung!! Plus, it actually tastes really, really delicious?!! (That I wasn’t expecting!!!) Enjoy. Oven Baked Mushroom Risotto – No Stirring!! Boil the kettle and put the oven on at 200c. Finely chop onion using Food Chopper and add to Rectangular Baker. Using Egg Slicer Plus and/ or Forged Cutlery Knife slice both boxes of mushrooms. Add to Rectangular Baker. Add box of rice to Baker. Using Easy Read measuring Cup measure 1 litre of boiling water. Add double the amount of stock cubes than is recommended on the box (stops it being too bland). Add to Rectangular Baker. Put the coriander in the 250ml Prep Bowl and chop using the Professional Shears. Add to Rectangular Baker. 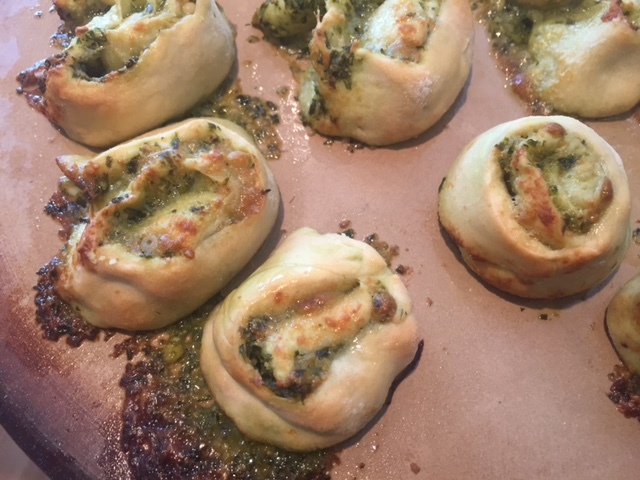 Crush garlic using Garlic Press and add to the baker (no need to peel the garlic first!). Then using Mix ‘N Scraper stir risotto. Put it in the oven for 30 minutes. Whilst cooking grate the parmesan using Microplane Adjustable Fine Grater. When the risotto is cooked remove from the oven. Add parmesan and Cream/ Crème Fraiche. Stir using Mix ‘N Scraper and leave for 5 minutes. Serve. Oh my goodness, it has been sooo long since I posted a new recipe?!! Where has that time flown? Well, I am pleased to say that I return today with TWO new recipes. Both of which I didn’t expect much from, but both of which surpassed all expectations! This first recipe is a 70’s throwback recipe for Pineapple Upside-Down Cake – made in the microwave!! My first thought was that it was going to taste too spongy or ‘fake’ but I was blown away with how light, fluffy and moist it was. I don’t know how much of this is to do with the Pampered Chef Rockcrok, but I love it – and will be making it again! 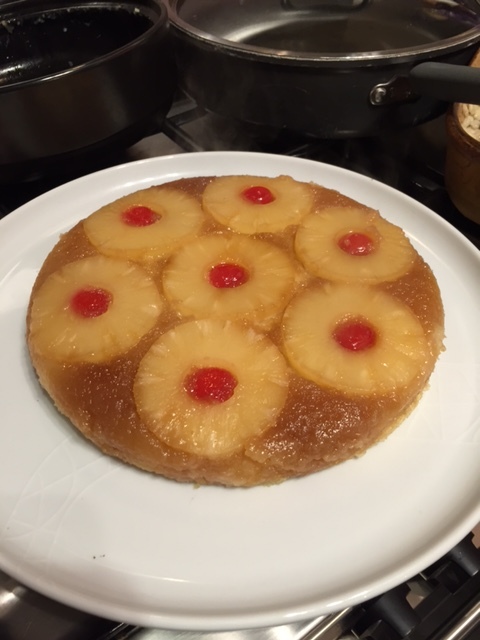 Pineapple Upside-Down Cake – made in the microwave?! Melt the butter in Rockcrok Everyday Pan over a medium heat until melted (approx. 1 – 2 minutes). Add brown sugar and cook until sugar is dissolved and bubbling, stirring continuously with Small Mix ‘N Scraper. Remove from heat. Open Pineapple tin using Smooth Edge Can Opener. Using Stainless Colander drain pineapple. Arrange pineapple slices in a single layer in base of Rockcrok. Place a cherry in centre of each pineapple slice. Using Easy Read Measuring Cup measure 100ml of milk. Put butter in 500ml Prep Bowl and melt in the microwave (about 30-40 seconds). Remove from microwave to cool slightly. Place flour, baking powder and caster sugar in Classic Batter Bowl; using Bamboo Spoon mix well. In Small Batter Bowl, whisk melted butter, milk and eggs together until well combined using Stainless Whisk. Pour egg mixture into the flour mixture; then whisk together until well combined and smooth. Slowly pour cake batter over pineapple. Microwave, covered, on HIGH 9 – 10 minutes or until a wooden cocktail stick or cake tester comes out clean when inserted into centre of cake. Remove pan from microwave. Run Skinny Scraper around cake edges to loosen. Immediately invert cake onto Shimmering Glass Round Platter. Serve warm. 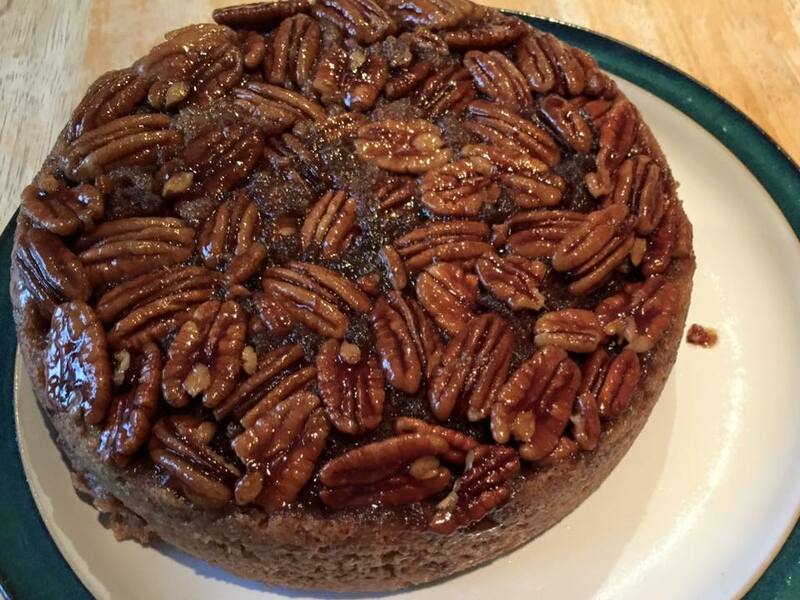 This amazing cake is so delicious and moist and yet is cooked in a Microwave??!! Now, before you back away from the recipe shaking your head in horror – please, please give it a go. It just doesn’t taste at all like its been cooked in the microwave. Honestly! The main product used for this is a brand new one which is coming out in March (2015!) and is going to be fondly called the “baby Rockcrok” (or officially the 1.9ltr Rockcrok Casserole). It may be that the Rockcrok actually helps in making this taste like it wasn’t cooked in a microwave – I haven’t tried it in anything else to compare it. If, however, you try it out and don’t have (yet!) a Rockcrok please do let me know how it goes. Melt butter, 50g of the sugar and water in baby Rockcrok (1.9lt) on hob over medium heat 3-5 minutes or until sugar is dissolved and mixture begins to bubble, stirring continuously. Remover Casserole from heat. Cool for 2 minutes. Starting on the outside edge of the casserole, carefully place about 85g of the pecans upside down, close together in a circular patter, in brown sugar mixture. Set aside. Coarsely chop remaining pecans using Food Chopper; set aside. Grate carrots using Microplane Adjustable Coarse Grater into Classic Batter Bowl. Add remaining sugar, flour baking powder, cinnamon, mixed spice, orange zest (easiest tool for this is the Microplane Zester) and chopped pecans to the grated carrot. In Small Batter Bowl, whisk eggs and oil together using Stainless Whisk. Pour egg mixture into the carrot mixture; mix until well combined using Small Mix ‘N Scraper. Spoon mixture into Casserole and level surface. Microwave, uncovered, on HIGH 7-9 minutes or until cake tester or wooden cocktail stick comes out clean when inserted into centre of sponge (the top will look quite moist and sides shrunken slightly away). Remove cake from microwave to Stackable Cooling Rack. Let stand, covered, for 5 minutes. Carefully invert cake onto serving plate. Serve warm (with or without cream!) or cold. Microwave cooking times are tested using 900w microwave oven. Please adjust according to suit your microwave oven.